Istria, as the most western part of Croatia, is the heart of the north Adriatic Sea. Close to the old seafarer port of Trieste and only a few hours by boat from Venice the port of Pula is the shipyard “AVANGARD SHIPYARDS”. It is a wonderful deep-water port, well protected and perfect for larger yachts to stay and start their cruise of the Adriatic. Among others, the Romans settled there, and the most preserved Amphitheatre in the world still tells of the glory of the ancient nation. It was the Austrian nation’s emperor who made this port into a large naval dockyard for their ambitious dream of constructing navy ships. Friendly people and a close to Italian life style, with excellent food and a clean environment, create a perfect location for joyful experiences. The Adriatic coastline, including the islands, is nearly 6000 km long. These unexploited resorts enable people to enjoy the benefits of “the cleanest sea in the world”. Hundreds of islands, with ten times more gulfs and bays, are a good reason to stop and find the harmony that comes from natural beauty, climate and people. Contact us regarding any queries related to repair or refit of your yacht. 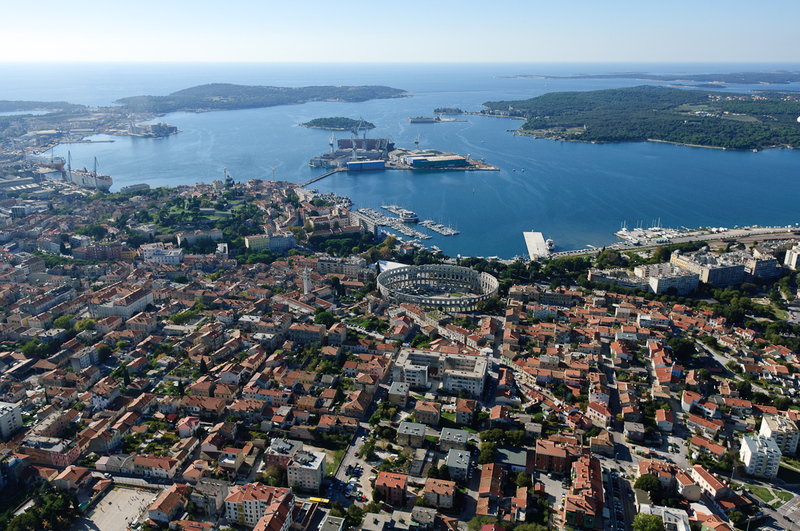 Pula is the largest city in Istria county, with a metropolitan area of 90,000 people. The city itself has 62,080 residents (2005), while the metropolitan area includes Barban (2,802 residents), Fažana (3,050 residents), Ližnjan (2,945 residents), Marčana (3,903 residents), Medulin (6,004 residents), Svetvinčenat (2,218 residents) and Vodnjan (5,651 residents). The Colchians, who had chased Jason into the northern Adriatic, were unable to catch him and ended up settling in a place they called Polai, signifying "city of refuge". Ancient period View of coast through Pula Arena. In classical antiquity, it was inhabited by the Histri, a Venetic or Illyrian tribe recorded by Strabo in the 1st century AD The Istrian peninsula was conquered by the Romans in 177 BC, starting a period of Romanization. The town was elevated to colonial rank between 46-45 BC as the tenth region of the Roman Empire, under Julius Caesar. During that time the town grew and had at its zenith a population of about 30,000. It became a significant Roman port with a large surrounding area under its jurisdiction. During the civil war of 42 BC of the triumvirate of Octavian, Mark Antony and Lepidus against Caesar's assassins Brutus and Cassius, the town took the side of Cassius, since the town had been founded by Cassius Longinus, brother of Cassius. After Octavian's victory, the town was demolished. It was soon rebuilt at the request of Octavian's daughter Iulia and was then called Colonia Pietas Iulia Pola Pollentia Herculanea'. Great classical constructions were built of which a few remain. A great amphitheatre, Pula Arena was constructed between 27 BC - 68 AD, much of it still standing to this day. The Romans also supplied the city with a water supply and sewage systems. They fortified the city with a wall with ten gates. A few of these gates still remain: the triumphal Arch of the Sergii, the Gate of Hercules (in which the names of the founders of the city are engraved) and the Twin Gates. This town was the site of Gallus Caesar's execution. During the reign of emperor Septimius Severus the name of the town was changed into "Res Publica Polensis" In 425 AD the town became the centre of a bishopric, attested by the remains of foundations of a few religious buildings. Avangard Shipyards offers a complete service for your yacht. Copyright © Avangard Shipyards d.d.